Dude, sorry for the ridiculous cleavage shot. apparently she pulled my shirt down a bit! As you are reading this, I am starting my 9th week of postpartum work. 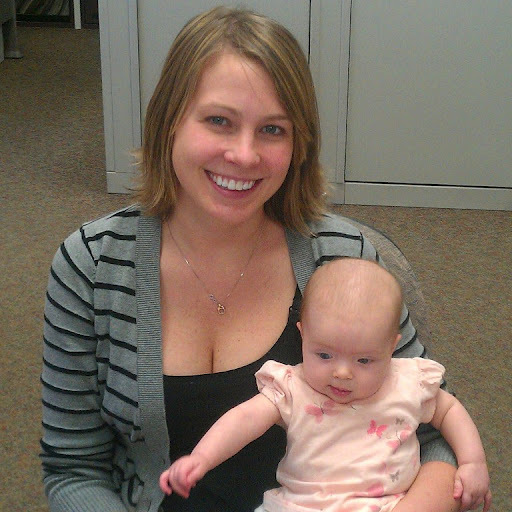 That means I’ve officially been a “working Mom” (8wks) for as long as I was a SAHM (8wks). I don’t really agree with those titles, because honestly, a lot of my days at home with Stella are more exhausting than any day at the office, but there ya go. Honestly, I am pretty happy with how things have worked out! In a perfect world, I’d be working just for fun – for personal fulfillment – and I’d be able to work just a couple of days a week in a super flexible job instead of four days a week, nine hours a day. (This is not really something I’ve have pictured myself saying pre-baby…so weird.) I wouldn’t be working because we needed the income, and I wouldn’t be forced to leave Stells on days I just wanted to stay home to cuddle and play with her. *I work four nine hour days instead of five eights, which I’m loving. You pay for daycare by the day (around here it’s $40/day), so it’s more cost effective for us, plus I still get three full days with Stella. *My normal schedule is to work Monday, Tuesday, Thursday, and Friday, so I never have to leave Stells for more than two days at a time, unless I’ve requested a 4 day weekend, in which case they’re super flexible with me, which is awesome. *Stella goes to daycare Monday & Tuesday, and my mother-in-law and sister-in-law take turns watching her Thursday and Friday (usually in our home), so she is getting lots of one-on-one time with family, plus a little exposure to other kids. *I almost always get to visit Stella over lunch and nurse her. *I get pumping breaks whenever I want mid-morning and mid-afternoon. This means my schedule on work days is not too shabby! 6am-8:15am: Pump, shower & get myself ready, pack diaper, bottle, and pump bags while Daddy gets Stella up & ready, nurse Stella & then drop her off at daycare if it’s Mon/Tues. 1hr lunch break (paid for 1/2 of it). Go feed Stella. Stella generally wakes up around 12-1am….then depending on the night, either once more around 4-5, or she’ll be up every 2 hrs (12,2,4,6)… we aren’t sure why. I usually read blogs / check emails during my pumping breaks and during middle of the night feedings, and that’s honestly been one of the hardest thing to keep up with / biggest things I miss (other than Stella of course!) about staying home during the day. At least when I was home, I had a bit more time for that. At the same point, working outside the home has been good for me to learning how to prioritize laundry, meals, showers, and the like. Now I’m working hard to try to add exercising back into the mix – I just FEEL BETTER if I’ve worked out. Overall, I’m glad I took the job. I miss, miss, miss my lazy days with Stella (and by lazy, I mean incredibly busy but we had all day to get things done whenever it worked out best to do them). It’s hard knowing that over 50% of her days are spent with people other than me. It’s hard knowing that me staying home with her just isn’t an option right now. BUT, it’s great knowing that she’s in good hands, and it’s great knowing that me having a steady income right now is helping to pay some bills and is giving my hubby the flexibility to start his own company, which is beyond exciting in our household! Working outside of the home is hard some days, but I’ve been blessed to be reminded of the importance of counting down the minutes until I get to see my baby girl instead of counting down the minutes until her next nap. *ETA – I know $40/day doesn’t sound like much to those of you that live in urban areas, but remember, I live in tiny, tiny town (pop < 1000) and even though our cost of living is ridiculous thanks to living close to a big time ski resort, typical wages are NOT great (think $12-17/hr for the average person working in town), so when full time daycare costs around $850/month, that takes a HUGE chunk of your income when salaries are so low. We are beyond blessed to usually only be spending $320-400/month on daycare thanks to the help of family and friends. I'm glad taking this job turned into such a positive thing. I know it was hard to know at the time if it was the right choice or not, but it sure sounds pretty perfect to me! So great things are going well for your family! It sounds like (nearly) the perfect situation.I must say I'm really envious of what you pay for daycare – we live just outside Boston, and Ellen's daycare is $363/week! (for 5 days) Takes a big chunk out of our income, but we're still much better off with two incomes minus daycare expenses. I've been a lurker for a while, but I think this is the first time I've left a comment. I loved what you said about 'counting the minutes until you see her instead of counting the minutes until the next nap.' I returned to work yesterday 😦 and already feel the same way. Being a SAHM might be in my future, but for right now I need to be a working mom too. I'm so glad things have worked out so nicely for you. It kills me to be away from Raegan for a night or two a week. We had to work it this way or we'd be paying a ridiculous amount for day care. So off to work I go on Friday and Saturday nights. But I will say the pumping breaks are nice…I take my iPad with me and watch a 30 min sitcom while I pump. Without commercials it's the perfect length of time. I'm jealous you are able to work so close to home. I wish I could come home and feed Raegan, but she's pretty much sleeping through the night so it would be kind of pointless to come home to feed her :)I wish we could all afford to be SAHM's but in this economy, I'm actually grateful to be employed. Wow Josey, that is quite a busy schedule! I know I always feel loved when you comment on my posts (and wonder when the heck you have time to do so!) I figured it was during feedings. :)"But I've been blessed to be reminded of the importance of counting down the minutes until I get to see my baby girl instead of counting down the minutes until her next nap." – what a great outlook!You've got a good thing going lady! Keep up the hard work! That is one well taken care of baby. We have a similar work schedule 🙂 I work M,T,Th,F, and I also spend my lunch breaks at home with Grace. At first I was kinda bummed about not having a longer weekend, but then I started to look at the bright side. Like you, I also find it so nice that Grace never has to go two days without a full day with me. However, I think it is more like I never have to go more than two days without her 🙂 You and Stella both look beautiful and happy! I totally agree about counting down the minutes until seeing Maggie vs counting down the minutes until nap and then being disappointed when it was too short. I love that about working. Perspective!!! I plan on going back to work after the baby, I haven't decided how much time off I will use either 10-12 weeks. My supervisor a mom too said it's really hard going back. Looks like you are doing awesome and have a great schedule and family to work with! This timing of your post was perfect for me. I'm getting ready to go back to work full-time and am terrfied about it. Reading about your success has made me realize that maybe going back to work isn't the worst thing for me…and maybe it's my own blessing in disguise. Thanks for sharing.